Though considered as a heavy tool along with slightly and wide blunt blade, meat cleaver o simply coined as cleaver, is used to cut through bones and chop thick meat. 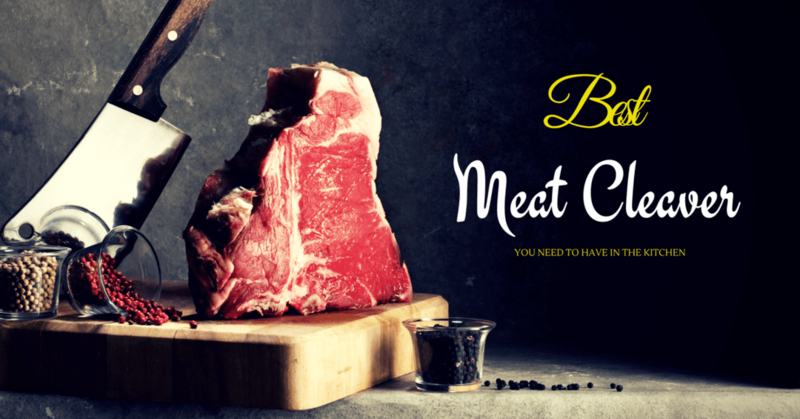 In most cases, it is used at butcher shops as well as restaurants. Indeed, a cleaver is a great tool that you should have in the kitchen. In fact, you can use cleaver once opening lobsters. With regards to the construction of meat cleaver, commercial cutlery is made with the use of either two methods and they are stamping or forging. Here, a heated bar steel is being roughly shaped under a drop hammer that forces the steel to take the immense pressure. If the steel blade forms a shape of a knife, the blade goes through a grinding and honing process in order to achieve the final shape as well as smoothest edge. Cleavers of this construction are a lot thicker, stronger and heavier compared to the stamped ones. They also have bolster in between the heel and the handle and might offer a better balance too. Indeed, forged cleavers are more expensive compared to the stamped cleavers. A flat steel sheet is cut into a desired knife blade shape through a hydraulic press. The blade banks are being sharpened by the undergoing multiple grinding steps as well as honing process. These stamped meat cleavers are known to be thinner as well as lighter than the forged blade. In addition, they don’t have a bolster in between the heel and the handle and it might not provide the same balance as the forged blades. And they are less expensive too. Two raw uncooked Veal tomahawk steak with garlic, salt, seasoning and vintage butcher cleaver on black stone slate board. Top view with space. The usual blade of a meat cleaver is 15 centimetres or 6 inches long. It is either made of stainless steel or of high carbon steel. You might find some cleavers along with a handle and blade being constructed as one and some having separate attached plastic or wood handle. 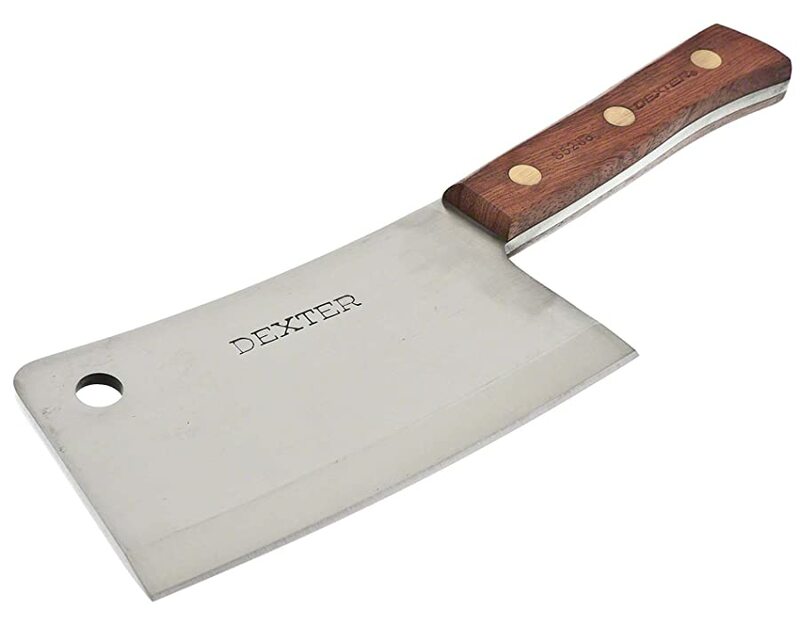 There is this fact that a meat cleaver is a machete in the kitchen. It has a squared-off design that renders weight and toughness to your every chop. But why is there a need for a cleaver to be heavy? 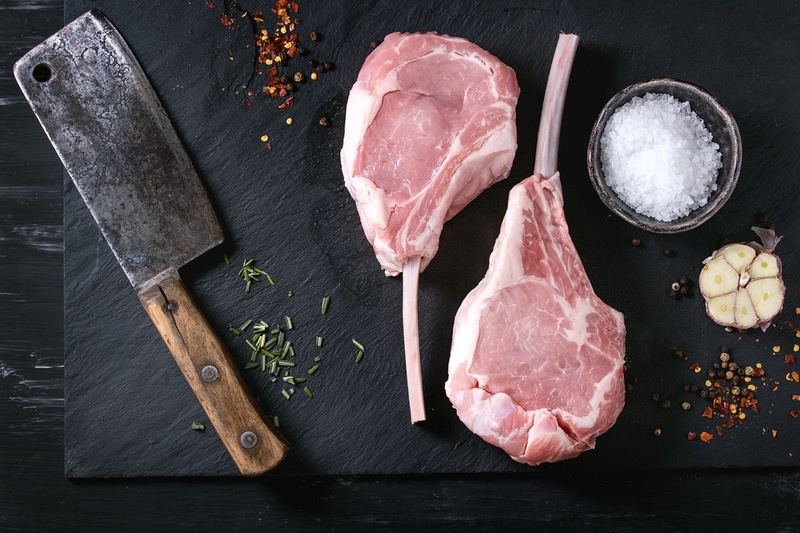 Once planning to cut through bones, cartilage, sinew and other thick meat, you definitely need a heavy blade which could do the job with only a single swing. So, once shopping for the best cleaver, always remember that the heavier, the better! Once in the process of choosing what cleaver to purchase, you might ask which is better for you – a meat cleaver or a Chinese cleaver. And always take note of the difference between the two. In general, Chinese cleavers are being used in the same way as the knife of the chef. They are a lot thinner compared to meat cleavers and are also used on softer foods. On the other hand, the meat cleaver is designed to tackle medium and small sized bones. A meat cleaver could chop meat and bones a lot efficiently compared to Chinese cleaver. 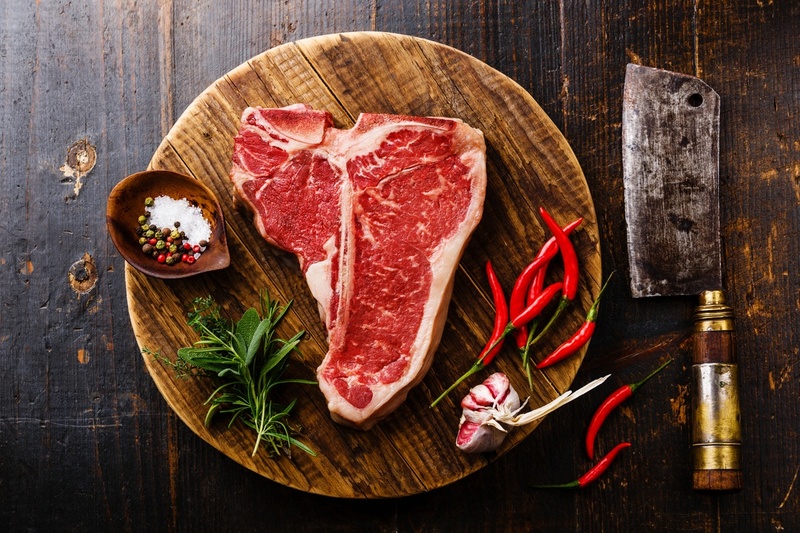 And for large bones as well as animal carcasses, a butcher would use band saws and axes and then a meat cleaver in chopping the meat into smaller pieces for sale. However, there are small variations into the rule. Chinese cleavers come in different sizes and thickness. If you are buying a Chinese cleaver you might see that they are graded from one to four. But for a grade 1 Chinese Cleaver, the thickness will be very close to the standard Western meat cleaver. Along with that, the Japanese also use a numbering that slightly varies from Chinese way of doing things. But, everything that is above the number 4 grade is thin and must not be used in order to chop hard meat and bones. While in the process of shopping for the best cleaver, there are certain factors that must be considered. But, two of the main considerations that must not be ignored is the handle and the blade. The first thing that you must look for in a handle is the full tang. This is the part of the blade which serves as the core of the handle. A full tang could be seen running down the center of the handle in most cases all the way up the hilt. Sometimes, they are fully encased in a molded rubber or altogether changed with exactly weighted stainless steel handle. Indeed, full tang ones are durable, strong and well-balanced. There is a need to avoid a partial tang knives completely as they are top heavy that might break or crack in time. Cleavers are thick, short, heavy, rectangular and not longer than 15 to 16 cm in length. Though the cleaver is primitive in its function and use, the construction must be refined as much as possible. You must always choose a cleaver forged from the single blank of the high-carbon stainless steel. There is a need for the blade to be heavy enough to power through joints and bone, hard enough to retain sharpness through heavy and rough use and sharp enough to chop through meat without any damage at all. For the second option in this list, this meat cleaver is a right option you must have in the kitchen as it is definitely an affordable product right for the budget. This cleaver offers accuracy in segmenting and trimming larger meat cuts as well as large fruits. It has stainless steel blade that is rust-resistant and easy to use as well. And also, this product is designed and built for commercial kitchens that could withstand heavy use. If you have arthritic hands and if you are experiencing wrist tension, then this one is a perfect choice since it is ergonomically designed. It also has a heavy feel that offers better balance during swings. You might find a hole at the top corner of the blade intended for hanging and also to save your counter space. This is also dishwasher safe weighing 1.1 pounds. However, be wary that the blade of this cleaver might get dull shortly and a bit heavy for those with smaller hands. I have many reasons why I put this one on top. If looking for a cleaver that has this reputation when it comes to clever designs and craftsmanship, this one is right for you. This product is definitely one of the good meat cleavers produced by Dexter-Russell. In fact, this one is a destroyer! It has the ability to hack through thick meat without having any problem and could easily chop even the toughest joints. And with regards to aesthetics, this product is known not just because of its functionality but with its design too. The handle is made of rosewood and brass rivets would hold the blade tang and handle together providing a rustic but a stylish look. Proudly made in the USA, this cleaver weighs 2.5 pounds. Again, it might be too big as an option to those with smaller hands and to those with arthritic hands. Another great option that deserves to be on this list is the J.A. Henckels International Classic. This one is built perfectly for home use. As a 6-inch stubby cleaver, this one is a workman’s brand but definitely affordable. There is a hole in the top corner that is used for hanging the cleaver on a hook or peg. It also features handles which are shallower compared to other brands making it perfect to those with small hands. It is also recommended that you wash this cleaver with hands rather in the dishwasher though considered as dishwasher safe. It weighs 1 pound and is made in Spain offering a lifetime warranty too. Nevertheless, the handle might not be that smooth and this one is too small for some other users. This product features a blade that is honed and ground manually. It comes as either a classic or stainless one. Knowing that it has a thick spine, it could make heavier chops and the assurance of sturdier feel is guaranteed. I included this one in this list for those who are looking for a traditional cleaver that features a high carbon steel blade along with the assurance of cutting vegetables too. Besides, in order to keep with the traditional design, it has a 3-inch handle that comes in walnut wood that perfectly goes with any kitchen along with a non-slip grip feature. Also considered as best-selling Chinese meat cleaver, it weighs 10.4 ounces. But, you might have a problem when it comes to the handle as it could easily break. Last but not the least, I included this cleaver particularly to those who choose a more industrial look. 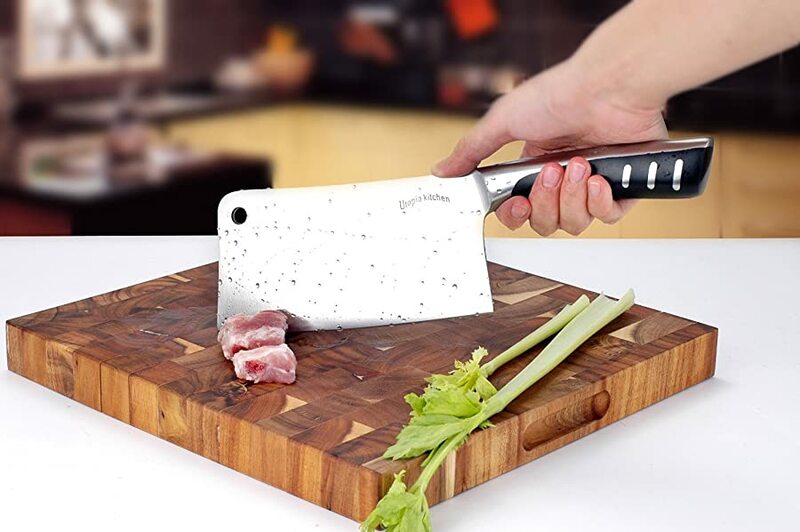 This cleaver used to have cause grip problems for some users due to the wood-free design on its handle, however, it was already fixed and a more ergonomic metal handle design is now guaranteed. This product features a full-tang construction that is smart and offered exceptional craftsmanship. It has a blade that is stamped by hand at a 15-degree angle. It is relatively smaller compared to some other cleavers making it perfect for those with smaller hands. In addition, those users with arthritic hands could now comfortably use a meat cleaver by keeping the weight a bit low and because of its ergonomic design. This cleaver weighs 1.3 pounds. There are also certain things that might bother you about this product including its price and this one is rather short, not great for cutting or chopping thick bones. 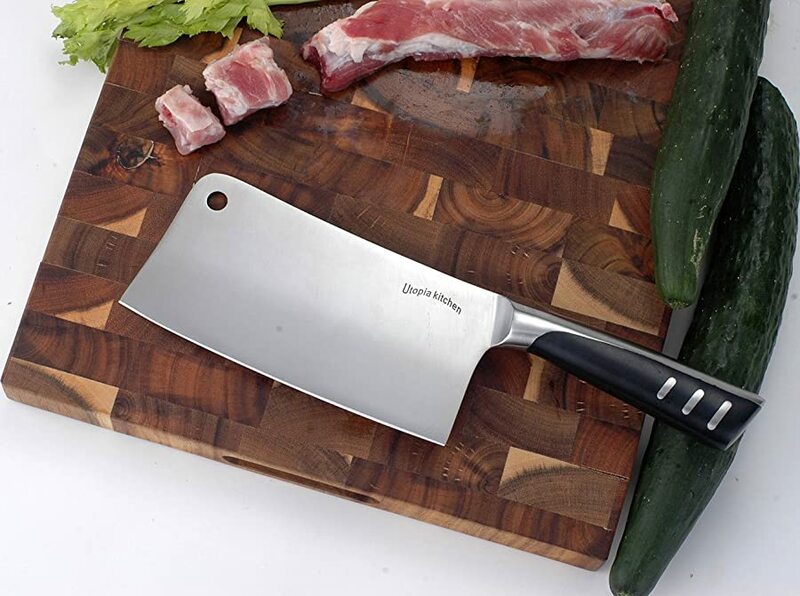 If you have more questions or any suggestions in connection to the best meat cleaver, then don’t hesitate to leave your comments below. Hit like and share this article too! 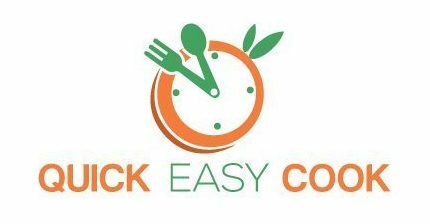 For more cutlery & knife reviews like boning knife, butcher knife and knife sharpener, click here.